MY GRECA UNICORN DECORATIVE SEQUIN THROW PILLOW – The cute trendy unicorn design that girls love! Our mermaid unicorn sparkly pillows are made of high quality materials, reversible sequin (Front) and soft suede fabric (back). The zipper is hidden, making the reversible unicorn pillow cover look elegant and nice on both sides. Apart from decorative, this pillow sham can be relaxing and fun, girls will enjoy flipping the sequins, feeling soft and good to the touch to change pillow color. Design: Sleeping unicorn design with flowers, stars and eyelashes detail. Meterial: sequin and suede fabric. CLICK THE “ADD TO CART” BUTTON NOW! and decorate your bedroom, bed, sofa or chair with this fun, relaxing and decorative unicorn mermaid pillow. TRENDY UNICORN DESIGN - The sleeping unicorn face all girls love, with colorful flowers, stars and eyelashes details. 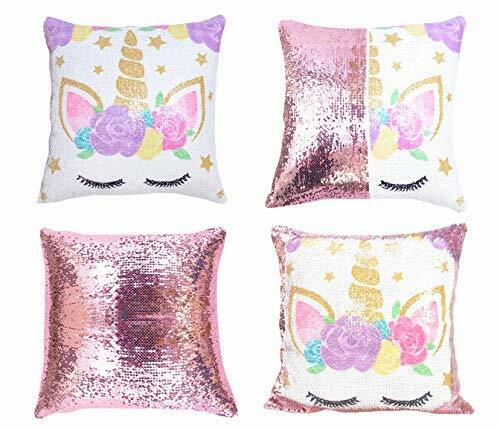 REVERSIBLE SEQUIN - Dynamic unicorn pillow sequin fabric turns pink rose color as you run your fingers over. QUALITY FABRIC - This 16" X 16" (40 cm X 40 cm) unicorn pillow cover is made of reversible sequin (front) and soft suede fabric (back). PERFECT GIFT - from little girls to young adults, the unicorn theme has captured everyone's attention. This soft to the touch dynamic mermaid reversible unicorn pillow sham will be ideal for home decoration or as a magical and memorable gift. PILLOW COVER ONLY - You will get unicorn decorative pillow cover only. You can purchase the insert according to your preference. We recommend 16" X 16" (40 cm X 40 cm) pillow insert. Foamily Premium Hypoallergenic Stuffer Pillow Insert Sham Square Form Polyester, 16" L X 16"